USB Digital media data recovery software restores lost or deleted files, folders, photo, audio, video, songs from all USB removable media storage devices. Data retrieval software recovers data when error messages like “Drive Not Formatted”, “File not found”, “Drive not accessible” are displayed while accessing your removable storage media on your Desktop or Laptop PC. File recovery software recovers data from all major types of files such as avi, png, bmp, jpg, jpeg, mpeg, mov, wav and other formats from various USB removable media drives. Software enables users to save log files to specified location in storage media for future reference. Supported Digital Media devices - Compact Flash Memory card, Memory Stick, Mobile Communicator, PDA (Personal Digital Assistance), Handheld Computers, Smart Media, Micro drive etc. Supported Brands of removable media - Kingmax, Super media, Apacer, Kingston, Viking, Super Flash, Transcend, SanDisk etc. 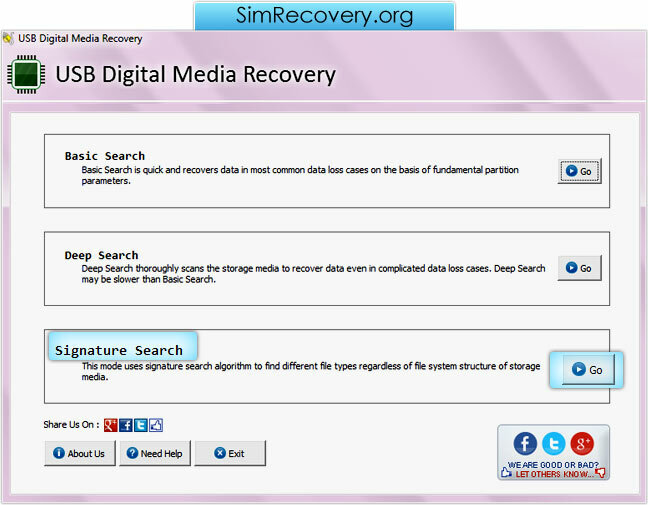 Supported size of digital media - Recovers data in all major storage capacities.